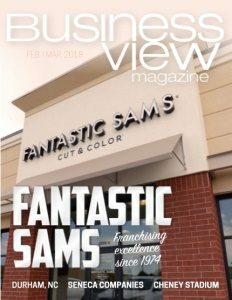 Business View Magazine interviews representatives of Nalle Custom Homes, as part of our series on best practices in the custom homebuilding sector. Nalle Custom Homes is synonymous with exceptional home design and construction in Texas. 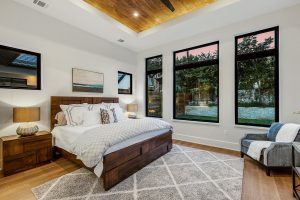 With over 500 gorgeous homes completed in and around the greater Austin area, client satisfaction is the top priority, and they’ve earned a stellar, well-deserved reputation based on just that. Owned and operated by the Nalle brothers, the company came about as the result of important lessons learned while Tilghman Nalle was working for a large production home builder. 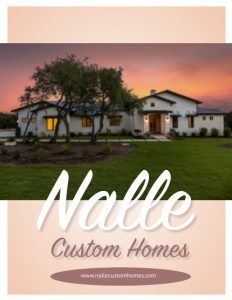 Today, Nalle Custom Homes builds an average of 40 homes a year in Austin proper and area neighborhoods, such as Bastrop, Hays and Travis Counties, Rollingwood, West Lake Hills, Tarrytown, Wimberly, Drifting Springs, and Driftwood. Along with the Nalle brothers, 10 full-time employees, including talented Lead Architect, Carl Trominski, Head of Purchasing, Jason Ross, and Head Designer, Matt Widmer, make up the in-house team. The Nalle brothers each have their own strengths and divvy up the company’s operations accordingly. Owen and Tilghman take care of initial meetings, estimating, and site evaluations on the front end. Owen also oversees the office and finances. Tilghman’s focus is new clients, bids, and plan design. Lee and Jesse focus on managing the construction and workforce, and making sure projects go according to plan. Lee is head of construction and has four superintendents to help manage construction activities, while Jesse has an instinctive feel for the speculative side. About 80 percent of the work is custom contract, but the company still builds six or seven speculative higher-end projects a year, usually on prime real estate the brothers find themselves. In the Austin market, many companies build either $1 million or $500,000 homes, whereas, Nalle Custom Homes have price points from $500,000, right up to $2.5 million. That versatility gives them a wide customer base. Leveraging volume to get preferred pricing from tradesmen and vendors is beneficial for all concerned – the company, the vendors, and especially the homeowners, who ultimately benefit from lower home prices and better service. 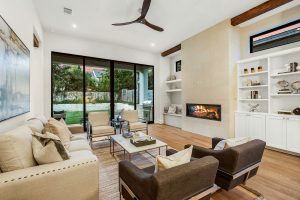 “Due to the fact that we’re the larger custom builder in the Austin area, we can guarantee them a certain amount of work – and they can provide us with a little better price point on their products and services,” says Tilghman. “We prefer to partner with the vendors, rather than switching AC or plumbing companies on every home and trying to get the best bid but lose quality. Showpiece kitchens with high-end appliances and custom cabinetry; large master closets; large master baths are on every client’s wish list. And light is the be all and end all. Today’s dream homes encompass soaring ceilings and huge sliding doors that give a ton of natural light. Standard windows have given way to ‘walls of windows’ that bring the inside and outside together. Nalle Custom Homes also offers the latest in “Green Building” options. The company knows the importance of staying up-to-date on innovative products to please their environmentally-conscious clients. The most popular green feature is spray foam insulation, which they have used in more than a hundred homes and had nothing but positive feedback. They also offer higher efficiency air conditioners, tankless water heaters, hybrid heat pumps, and no VOC (Volatile Organic Compound) products. The temptation for a client to want to overbuild and spend more money than necessary is a common occurrence. “It’s so easy in custom homebuilding to make it bigger and bigger, and add more, more, more… that’s not always what a client really needs,” says Tilghman. “We try to keep value in mind and make sure they are getting the information they want, so when they’re paying a premium, it’s for items they will really appreciate.” Customers are obviously pleased with that personal attention to detail. So much so that Nalle Custom Homes does no advertising, no outside marketing. All their business comes from word-of-mouth. Past clients refer future clients because Nalle has gone above and beyond to give them a positive experience during the build, and ultimately the fantastic custom home they wanted. Check out this handpicked feature on S&N Communications – Foremost Resource in Infrastructure Construction.